Ministry Deputy Chief Executive, Child Youth and Family Ray Smith said good progress has been achieved in the youth justice sector since the research was undertaken and since the establishment last year of the cross government Steering Group for Young People in Cells. “We have already seen a reduction in the average length of remands in Police custody. 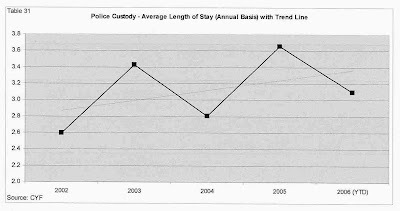 For the month of September 2006 the average length of stay in police cells for a young person was 2.5 days. This compares with 4.4 days in 2005. The trendline (the rather faint upward line) is what matters. The report says, If the current trends in offending and sentencing continue without the strengthening of community alternatives to custody and sentencing, as well as further development of CYF residential capacity, it is likely the length of remands and use of Police custody will only continue to increase. Despite the Ministry's "good progress" spin (ambulance at the bottom of the cliff stuff) the report is actually full of bad news. However, there were significant increases in violent offending. Apprehensions for violent offending rose by 36.4% over the previous 8 years and charges for violent offending increased by 57.6% between 2000 and 2005. This suggests it is the ferocity, not the frequency of offending which is changing. Therefore, it is predictable such increases in serious offending will amplify the number of custodial remands and sentences. This report establishes New Zealand has experienced a swell in the youth population and a disproportionate increase in violent offending among young people. Parallel to this, there have been significant changes in the sentencing patterns for young offenders with, a decrease in the use of Supervision with Activity and an increase in the use of Supervision with Residence. Combined, these factors have placed considerable strain on the limited custodial placements provided by CYF. Although the increase in the youth population is at its peak in 2006, its effects will be palpable until around the year 2030. There is no indication the increases in serious and violent youth crime will slow, anecdotal evidence suggests the 2006 statistics also show the same trend. Unless a number of measures are developed it appears the pressure on CYF Residences will continue to increase which will result in ongoing and increasing use of Police cells for young offenders who need to be kept in custody. Here is what David Benson-Pope had to say about 'research' which the Families Commission has, according to Sue Bradford, "signed off" and "paid for". The second issue I want to raise is in relation to the comments of Ms Collins about so-called research that, as such, was presented to the Social Services Committee by Mr Paul Blair from Rotorua. It is true that Mr Blair’s research—oh, sorry, Mr Blair’s work is probably a better description—was commissioned by the Families Commission. It is not true to suggest that the Families Commission had completed a full peer review of the work, or indeed had authorised its release. In fact, that work has not subsequently been released because the Families Commission found it—shall I say, charitably—“seriously wanting”. The fact of the matter is that that work covered a sample of, we believe, fewer than 15 people. Given that the cohort we are talking about, sole parents receiving a benefit, is around 90,000—it has reduced, but it is still too many, I know, but these are people who need that support—then 15 out of 90,000 is not what one, even in National Party circles, would describe as a very robust or credible basis for any research. I guess I am therefore not surprised to hear Ms Collins basing her specious arguments on that matter. 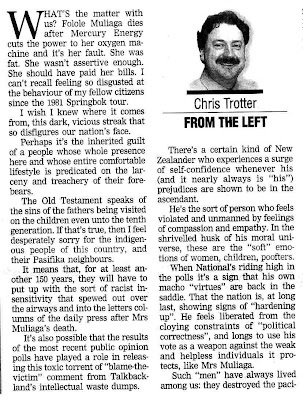 The DomPost is doing a series called New Zealand By The Numbers drawing on the Census 2006 information. Today they show how people earn money. Care in interpreting this is needed. The question asked people to identify the ways in which they had earned income during the past 12 months. It is not a snapshot in time. So although 92,172 people said they received money from an unemployment benefit during the previous year, at March 2006 only 44,549 were actually on an unemployment benefit. Likewise 70,551 people received money from a sickness benefit but at March 2006 there were only 46,072 people on a sickness benefit. But this anomaly I don't understand. 93,090 people said they received money from the domestic purposes benefit yet at March 2006 there were 103,362 on that benefit. That's nearly 10,000 people who either haven't filled in a form or aren't telling the truth. In fact, it's much higher than 10,000. Every year between 35,000 and 40,000 people move on and off the DPB so we should have seen a churning effect as with the unemployment and sickness benefits. The number should have been somewhere between 130,000 and 140,000. Now why wouldn't you tell the government you were on the DPB? The official Census 2006 net undercount, by the way, was 2 percent. Oh, this is funny. In January 2005 Paul Blair, Rotorua sole parent and beneficiaries advocate, forced a law change through an out-of-court settlement with the Ministry of Social Development. He forced WINZ to allow sole parents who split (as opposed to shared) custody of their children to both effectively claim the DPB, and avoid work-testing. A far cry from what the DPB was intended for. In the interim he applied for Families Commission research funding. It was granted and he went on to produce a report, 'Improving Work Life Balance for Domestic Purposes Beneficiaries Sole Parent Families'. Talk about adding insult to injury. Anyway the report was signed off, peer-reviewed, ready for publication and PAID FOR when Mr Blair used an excerpt in a submission (no doubt opposing) the government's social security amendment bill. David Benson Pope is understandably most unhappy and suddenly the report has been returned to the author as a 'final draft' for 'editing'. This is worse for Benson-Pope than if I had applied for the Families Commission Blue Skies funding and used it to turn out the criticism I currently provide free of charge. Lucky for the Minister I do not have Mr Blair's 'parasitic' tendencies. Am I supposed to feel sympathy? 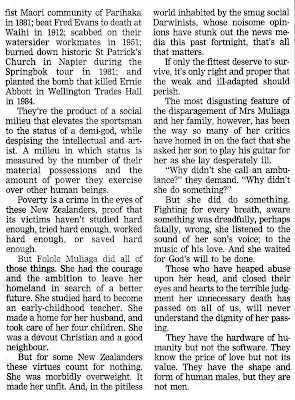 Reading the front page of the DomPost today I wonder how I am supposed to react to the news that the mother of slain Wanganui toddler was already expecting another baby. She is apparently full of rage against the Mob, hates them. Hates gangs. Not enough to say no to the dead child's Dad - who is presumably the father of the expected child - and still a Black Power member currently on remand for firearms charges. And here she is, clinging to a picture of her dead daughter, as well as him. Am I supposed to feel sympathy? There is every likelihood I paid tax to fuel their shoddy lifestyle and now I've paid for them to parade it to the media. The Police drummer Stewart Copeland has branded the band's second comeback performance a complete "disaster.....It usually takes about four or five shows in a tour before you get to the disaster gig. But we're The Police so we are a little ahead of schedule." I saw The Police on their original Synchronicity tour and they were a wash-out then. Boring and lifeless in 1984, it's hardly a surprise they are a "disaster" now. All was not lost though. Bryan Adams opened for them at Mt Smart and completely upstaged the supposed stars. And unlike The Police, he has only gotten better with age. Now the Greens want subsidised power for "families on tight budgets". How will the "basic block of power units at low cost" going to each household be decided? On occupants, number of rooms or house size? If the allocation is uniform across households, those who will be most advantaged are the elderly, who already have the highest living standards amongst low income people while the least advantaged will be large and young families with low incomes and high outgoings. Is this the aim of such a scheme? Won't high users of power like hospitals, schools and supermarkets etc end up paying more to subsidise "families on tight budgets", thereby pushing up other costs to consumers, including "families on tight budgets"? Is this just another way for the Greens to punish business owners, those loathsome capitalists? And, not that I agree with the scheme, but wasn't Working for Families about extra help for "families on tight budgets"? When will the Greens learn that subsidy schemes create incentives, distortions and abuse,are a nightmare to administer and police, are inherently unfair and serve no useful purpose? The key is probably father absence. My comment is simply that without government subsidy there wouldn't be a single parent industry. The same is true of Australia. But it is implicit in the second article that more should be done for "under-resourced" single parent families. More redistributory social policy doubtless. It's seems obvious that reversing the subsidy policy would be far more effective than increasing it. Yet, as ideas go, it never even rates a mention. What breathtaking hypocrisy from the politicians frothing to condemn Mercury and propose new criminal liabilities. They were never at my side when I called for accountability from the politicians and officials who design and run the parole system. The Mercury policy had to have extraordinary bad luck to hurt someone, no individual involved thought they were calculatingly allowing an innocent death, and this is the first known case of its kind. Those responsible for parole know with certainty that the evil men they release will hurt and kill. They deliberately do not keep count, but simple extrapolation from remimprisonment figures suggests that as many as 10,000 victims of avoidable violent crimes per year pay the price of the callous theory and carelessness of the parole mandarins. I hope the “corporate” bashers go ahead with their lawmaking plans. Then we’ll turn it on the public sector pharisees who cause the far worse mayhem. Regular readers will know I don't post on environmental issues. That is because I know sod all about them. But as the election draws closer I am grudgingly giving in to spending a little more time reading about such matters. There can be no doubt green policies will be right up there. Personally I am in the camp that says let's focus on the problems we can do something tangible and constructive about now, but I seem to be in a minority. This piece describes Kyoto as a scam. It's (surprise, surprise) readable, interesting, and a good beginner's guide to how the carbon credit trading operates. It is disappointing and frustrating to read that the US violent crime rate is up again for the second year running, after constant and significant drops from 1993. Criminologists and law enforcement officials offer varying theories for the upswing, including an increase in the juvenile population, growing numbers of released prison inmates and the rise of serious gang problems in smaller jurisdictions. Violent crime (recorded) in New Zealand is also climbing. From 2004 to 2005 by 6.9% and to 2006 by 5%. Much higher than the US rises of respectively 1.3 and 2.3 percent.